As we prepare for Memorial Day to honor those who have served their country and given their lives for our safety and well-being let us also remember the families in Joplin, Missouri who suffered a fierce attack from nature and are facing such trying times. This disaster hits home because our fellow employees at CertainTeed’s plant in Joplin, as well as their families, are facing that rebuilding right now. What I find interesting is the role that social media played in sharing information about the situation which jumpstarted a company-wide effort to begin a relief supply collection program. One of our employees in Claremont, NC posted a message on Facebook on Sunday night after hearing from one of her colleagues about the tornado in Joplin. Fellow employees on Facebook saw the post and the viral communication started to spread. Within 48 hours, following a message from our president and CEO, all of our sister plants, both CertainTeed and Saint-Gobain throughout North America, were starting relief collection campaigns. I was amazed at how quickly we responded and the outpouring of support shown by our employees during this week. The human spirit is a wonderful thing and is alive and well. 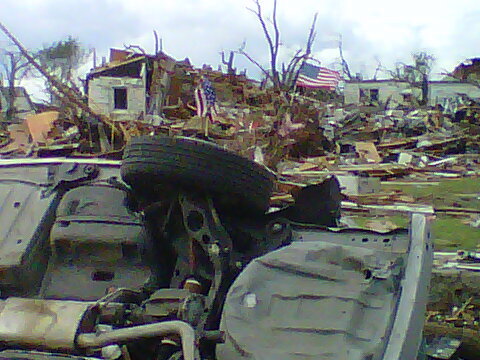 The images of Joplin shared by our colleagues are similar to those of a war zone. People are still missing, lives and properties have been destroyed, and now the residents are faced with trying to rebuild their lives from the rubble that now holds their memories. While we can provide food, clothing and shelter for those affected by this disaster we cannot erase the sights and sounds that will haunt them forever. We can never be totally prepared for a life changing event, whether it is a war, a terror attack, or a natural disaster; and we can never really comprehend the impact unless we have gone through it ourselves. Thanks for your support. Many CertainTeed and Saint-Gobain locations have answered the call. Our Joplin family are overwhelmed by the support and caring provided by their co-workers. I am proud to be a small part of this initiative and thank everyone for their generosity. We are sending clothing, bedding, and towels through a collection at our local Certainteed plant. We were heartened that our plant manager and others have called on us to help our fellow employees. I hope all that we send will be usable by those who receive it, or if not, by their friends and neighbors. Wish we could do more. Glad we can do something . . .
That is just terrible. I can’t even begin to image what it must be like to just be wiped out in a few seconds. Struggling to keep your family togethere. Good luck to all.